Abu Dhabi Marine Services “Safeen”, the marine services subsidiary of Abu Dhabi Ports, announced the purchase of two new state-of-the-art tugboats from Damen Shipyards Group aimed at supporting the AED 10 billion] expansion of Khalifa Port, Abu Dhabi Ports’ flagship deep-water port. The purchase of the DAMEN ASD 2411 tugboats was announced at the Abu Dhabi International Boat Show 2018. The contract was signed by Captain Adil Ahmed Banihammad, Acting Chief Marine Services Officer at Safeen, and Pascal Slingerland, Regional Sales Director for Damen Shipyards Group. Delivery of both vessels is due within three months. 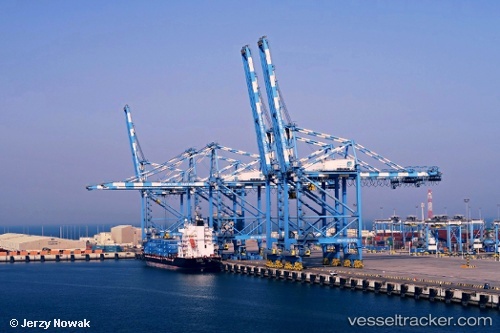 Lifting equipment firm Konecranes has netted a 54-crane deal for construction of the Khalifa Port Container Terminal (KPCT), plus an order for the Mediterranean’s largest-ever mobile harbour crane. In a release, the Finnish company said that it had been chosen by KPCT operator Abu Dhabi Terminals (ADT) in the UAE to supply an automated stacking crane system for the second stage of the building of the Khalifa Port facility. The 54 automated rail mounted gantry (ARMG) cranes will have a lifting capacity of 40 tonnes, stacking 1-over-6 containers high, with 30 of the cranes set to be nine-wide and 24 set to be eleven-wide. They will come with automation controls and Konecranes’ Active Load Control system.